By default, the system creates this “Fine” form. This “Fine” form can be deleted if you do not need it. You can follow this link here to learn how to delete or add a new type of form. You can add a fine by following the steps below. This article below will guide you on how to use the “Fine” form. Where can I find the button to add a fine? The button to add a fine is the blue “Add” button is located on the top right of the page, highlighted in orange in the picture below. Click on the blue “Add” button. Once you have done so, a new page will appear. Enter the details of the fine you are adding to the system. You can add, modify and delete details in this form to suit your company needs. You can learn how to do so by following this link here. The link will take you to the form builder article to learn more about the system’s form builder tool. 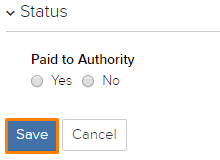 After you have finish keying in the details of the form accurately, click on the blue “Save” button, highlighted in orange in the picture below to add and save the fine form.